Tapioca, or cassava, plants have been in cultivation for its starchy tuberous roots for about many years, with its origins traced to Brazil. They grow very well in tropical areas where potatoes don't and act as a hedge against starvation. The plants are extremely drought resistant and are largely unaffected by the vagaries of nature and marauding animals that spoil surface crops. The tapioca plant Manihot esculenta is a tropical species of the Euphorbiaceae (spurge) family to which poinsettias and the castor oil plants also belong. In fact, it has some similarity to the castor bean plant (Ricinus communis) in its general habit; the structure of the seedpods is also similar, but not spiny as in castor. 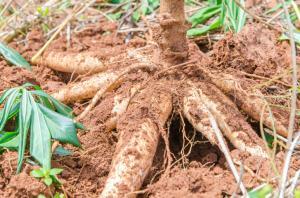 The tapioca plant is known by many names: cassava, manioc, and arrowroot, among others. It is sometimes called yuca too, but with a single 'c' to tell it apart from the large succulent plant yucca. 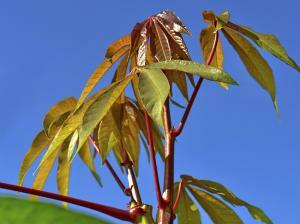 Cassava plants have enormous palmately lobed leaves that would instantly lend a tropical feel to the landscape. The leaves are particularly abundant in the first flush of growth, but eventually the lower leaves fall off and the plant will have a long cane for a stem, tipped with a small umbrella of leaves. Branching further reduces the size of individual leaves. It is thought to reduce the root crop, too. Variegated varieties of cassava are grown for their foliage rather than the roots. Cream and green is the commonest variegation, but you'll find green and bright yellow foliage with pink-red leafstalks, too. Flowers are insignificant as is the case with most Euphorbiaceae, and the castor bean-like seeds are contained inside pods that burst open when dry. Tapioca tubers grow underground in large bunches at the bottom end of the stem. The flesh of the tubers is opaque like that of sweet potato, but firmer, and white to creamy white. There's a long, hard string running right through the middle of the tuber; it is the tough central part of the root. It is difficult to find this plant referred to by variety in America versus calling them sweet, bitter or variegated. However, 'Sweet Jamaica Red' is a variety to look for when seeking out cultivars. Irrespective of the variety they all carry anti-nutrients and cyanide-forming chemicals. It's a protective mechanism this ancient crop has developed over the centuries. No part of the plant should be eaten raw or fed to livestock. The sweet variety has negligible quantity of toxic substances and normal cooking neutralizes them. Stick to the sweet variety and boil it and drain away the water before eating. The bitter ones have many times that amount, and it takes a bit more processing to make it safe to eat. It is best if gardeners do not attempt to harvest and process the bitter cultivars themselves. 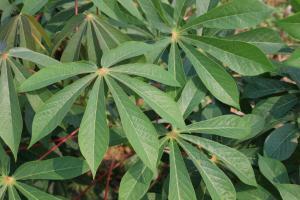 Cassava plants are for tropical to subtropical areas. They can be grown in the garden in USDA zones 8-11, and indoors in lower zones. They do exceptionally well in Florida. You can easily grow them with minimal effort and care. The difficult part is often sourcing the planting material. 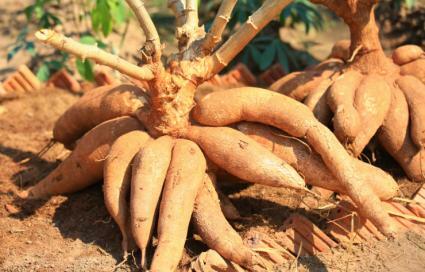 If you cannot find cassava plants in any local nursery, try online vendors who will send you a few cuttings via mail. Tapioca has starch-filled roots. What this means is that cassava plants cannot be started from bits of tapioca tubers; they don't have dormant buds or eyes. You need either stem cuttings or viable seeds. Once you cut the stem into pieces, it's very difficult to tell the head from the tail, so follow these practical steps to avoid that confusion. Hold the long cane in one hand and cut a tiny piece off its bottom end. Dip the cut end of the long cane in soil to coat. Cut off a one-foot piece and set aside. Dip the long cane in soil to coat the freshly cut end. Make the nest cutting and repeat the process until you use up the cane. Now each cutting has one soil-stained end. This end should go into the soil when you plant each one. Prepare a bed in furrows and ridges after tilling it well with compost and manure. If your area is waterlogged, you'll stick the cuttings into the ridges, otherwise they go in the furrows. They should be planted halfway in to the soil, slanted at an angle so that the new shoot will have headspace to grow straight up. Water well on alternate days and you'll see new growth in a week or two. Regular watering and occasional feeding will fatten up your tapioca tubers in about eight to ten months. The toxic substances in the plant tissue naturally shield cassava from pests, but large scale cultivations may be affected. If you spot aphids and whiteflies, occasional spraying with just water will suffice to dislodge them. Harvest the tubers any time after seven to eight months from planting time. Too early, it will not be starchy enough; too late, you'll get fibrous tubers. Cut off the stem one foot above the soil line. Remove the top layer of soil gently with a spade until the tubers are felt. Use a pickaxe to remove soil from between the tubers. Hold the stump and shake it to and fro to ease out the bunch from the soil. Slight dampness in the soil makes things easier. Harvest only as much you need at a time. When the sweet tapioca is cooked, it tastes sweeter than a basic white potato but not as sweet as sweet potatoes. The flesh is firmer too, with a chalky feel. 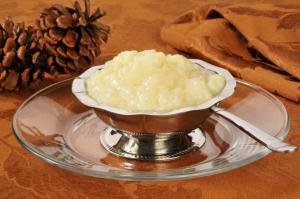 Depending on the time of harvest, tapioca may vary in taste and texture as new potatoes differ from the mature spuds. They can be boiled in water or roasted over open fire. They can be thinly sliced and made into tapioca chips or fries. Cut into small pieces, they can be used exactly like potato in stews and meat curries. The flesh can be scraped and dried to make tapioca meal or ground into tapioca starch. The tiny tapioca pearls can thicken puddings and soups. Cook the tubers after cutting them into two-inch pieces and peeling off the thick skin. Boil it in lightly salted water until tender and strain away the water. Boiled tapioca goes well with salsa, spicy dips or curries. Store peeled tubers in freezer bags for future use. To make fries, boil the tubers in salted water for 15 minutes and then drain and cool. With a mandolin, slice the flesh thinly along the grain for thin and long chips and across the grain for round chips. Deep fry them in oil. Leaves are rich in protein and fiber; cook them as you would cook collard greens, but drain off water after boiling it first. Whether you grow tapioca as a food source or just as a lovely landscape plant, you won't be dissappointed. This is truly a unique plant that is loaded with tropical beauty.